Students examine urine samples from patients and suggest a diagnosis and treatment plan based on test results. Patient charts and history are included so that students can use background information plus the results of tests to diagnosis the patient. Urine can be made from basic chemicals, mainly apple juice, food coloring, water, vinegar, and sodium hydroxide to create a basic solution. Students observe physical characteristics, such as smell and color and then perform tests to determine if the urine has sugar or proteins. Students also use test strips to simulate a test to establish the presence of ketones and human chorionic gonadotropin. In the final analysis section, students fill out a CER (claim, evidence, reasoning) to provide a diagnosis for their patient and a possible treatment plan. Instructions for five patients are included, though I would suggest giving groups only 1 (or 2) patients to test just to save time and expense of materials. Also, it reduces cheating when groups know that their patient will have different results than other groups. 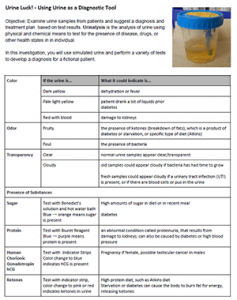 Materials Needed: Water, food coloring, egg whites (proteins), apple juice, HCL, NaOH, Ammonia – you can add other substances to make your urine look more realistic. Recommend making a large stock solution and then distributing to groups in specimen jars or beakers. Test stock to make sure desired test results occur. You will also need additional materials to perform the sugar test – Benedict’s solution needs to react in a warm water bath. Alternatively, you could buy glucose test strips. Biuret reagent is needed to perform the protein test, but it does not need a warm water bath. pH paper is used to simulate the pregnancy and ketone tests. I have a question about the Urine Luck lab. The instructor notes say patient 5 should have a basic pH, but the “recipe” says to add HCl. Shouldn’t that be NaOH instead? I think Pt 3 needs the HCl and Pt 5 gets NaOH?? Looking forward to using this lab next week. Thanks for the great resource! Thank you for noticing that. I was just setting up the lab today and also saw the error. I switched it on my master copy, if you want to download the newer version.